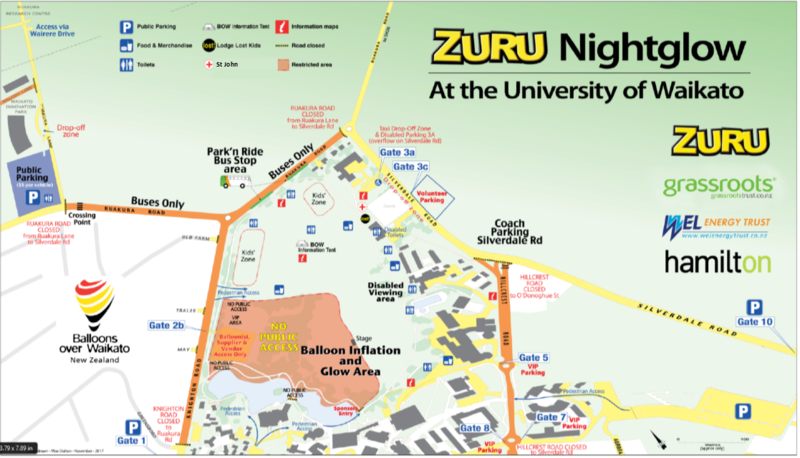 There will be a number of full and partial road closures around parts of The University of Waikato from 5:30am - 10.00pm on Saturday 23rd March 2019 for the Nightglow. Roads affected are Knighton and Ruakura. Silverdale Road is a one way system, meaning it will be a right turn only at Silverdale/Ruakura roundabout. All vehicles will be guided right to join the Morrinsville Road loop. There will be free public parking available on-site at Gate 1 Knighton Road and Gate 10 Silverdale Road or on surrounding street sides. There is paid parking for just $5 per vehicle located in Innovation Park. Entry to this car park is via Ruakura Road only. A drop off & collection zone is located at Innovation Park with access via Ruakura Road only, exiting onto Wairere Drive. There is a drop off zone only located by Gate 3A, Silverdale Road. Access to this drop off zone is via Morrinsville Road only. Note, due to the high volume of traffic, this cannot be used as a collection point. Please use Innovation Park as a collection point at the end of the night. Take the hassle out of finding a park or stressing about the traffic – use Waikato Regional Council’s FREE Park and Ride services. Five routes will run between key Hamilton locations and the University of Waikato for the Night Glow on Saturday, 23 March, 2019. This year we’re delighted to bring you buses from The Base, and Hamilton East as well as all the usual locations. More buses will be running on the routes, so plan ahead and let us do the driving. FREE buses will run between 4.15pm and 7.00pm from the Park and Ride sites and special event bus stops along the routes. After the Night Glow has finished, buses will run on a continuous as-available basis until all passengers have boarded for their return journey.